According to a number of workforce experts – Connecticut has a troubling shortage of candidates for manufacturing jobs in the state. By some accounts, the shortfall is close to 10,000. The construction trades are reporting a similar trend – with both a state and a nationwide shortage of skilled workers for trades like electrical and plumbing. Particularly surprising is the fact that many of these jobs pay good middle-class wages. Some Connecticut employment experts suggest a lack of emphasis by educators on the trades during the primary and secondary school years is a major contributor. Some educators counter by pointing out that school districts are disincentivized from encouraging consideration of jobs in the trades by state of Department of Education evaluation metrics that track how many students enroll in college after graduation and judging districts accordingly. Naturally, some in the Connecticut legislature believe they have a solution. There are currently two bills under consideration in the state Senate to address the problem (SB 854 and SB 856). Each of these bills seeks to require the Department of Education to consider workforce needs when evaluating district curriculums. They would also require schools to hand out materials concerning manufacturing and other skilled labor opportunities. Adding pressure to address the shortage of manufacturing job candidates in the state is a bill to encourage defense contractors to “Buy Connecticut.” This Senate bill would provide sales tax exemptions and research and development tax credits to defense contractors that work with in-state supply line manufacturers, instead of buying parts and products from out-of-state companies. If successful, this bill would only increase the demand for skilled workers. In the meantime, organizations like Skill Up for Manufacturing are trying to address the problem now. 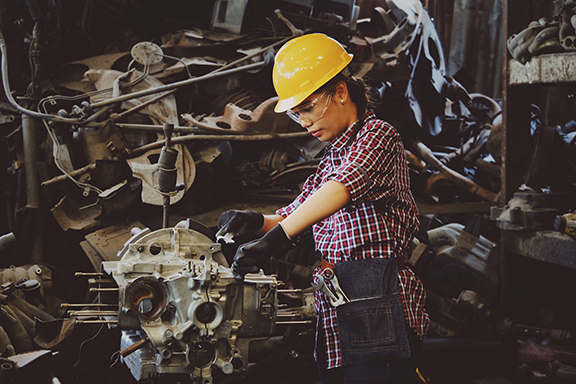 Skill Up for Manufacturing is a free five-week program run by the Workforce Alliance of South-Central Connecticut. Program participants spend six hours in classes five days a week at Gateway Community College in New Haven learning the skills needed for manufacturing jobs. The program aims to give job seekers a hand up while expanding the state’s skilled workforce. Connecticut’s public colleges and universities are also getting in the act. A new program sponsored by the state called Technology Education Advanced Manufacturing (T.E.A.M.) Works is calling for a collaborative effort between state government, educators and the private sector to fill up to 35,000 new manufacturing jobs needed in the state over the next two decades. The new program encourages the state’s network of 17 higher-ed institutions, and 85,000 enrolled students, to tap into advanced manufacturing technology training currently provided by private higher education institutions and technical high schools. What does the future hold? Hard to know but be assured it is one we will continue to monitor. Kainen, Escalera & McHale is one of the largest law firms in Connecticut dedicated to protecting and defending employers. Each of us has over 20 years of experience in all aspects of employment law and labor law and can help any employers with questions in this area of the law. Please contact us if we can help you.